Activision Discusses Call of Duty Fatigue "All the Time"
Call of Duty's developers don't think the franchise is heading the way of Guitar Hero. In a recent interview with GamerZines, Sledgehammer Games CEO Glen Schofield said Activision is wary of fatiguing Call of Duty players. Regarding the current one-per-year release schedule, Schofield said it's an often-discussed issue. "Absolutely, we talk about it all the time," he said. "That's why it's all about innovation. We're fans, so we know where we want to take it, we know what would make us happy, and we are listening to other fans out there." Whether you buy the innovation line or not, there's no denying the fans want more. A new Call of Duty game has been released each November for the last five years, with each release outselling the one before it. It's certainly no Guitar Hero, where the lack of interest became utterly palpable. "But you know what, it's not [losing momentum] right now, it's growing. You can see it out there. It's so big, people love it and I get so many tweets from the community. It's the biggest thing in entertainment. You stay paranoid because things can happen, but staying paranoid actually makes your game better." 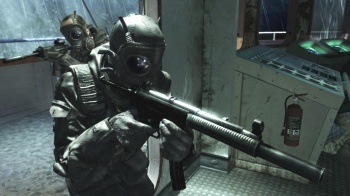 Call of Duty: Modern Warfare 3 releases on November 8 for Xbox 360, PS3, and PC. Perhaps you've heard of it?